1. Near Boulder, Co. in the mountains Function unknown 2.Cheyenne Mountain -Norad -Colorado Springs, Colorado Function: EarlyWarning systems – missile defense systems – Space tracking Levels:Multiple Tunnels to: Colorado Springs, Function: Early warning systems,military strategy, satellite operations Levels: Multiple NORAD is a massiveself-sustaining ‘city’ built inside the mountain Tunnels to: Creede, Denver,Dulce Base, Kinsley. 3. Creede, Colorado Function unknown Tunnels to:Colorado Springs, Colorado – Delta, Colorado – Dulce Base, New Mexico 4.Delta, Colorado Function unknown Tunnels to: Creede Salt Lake, Utah 5.Denver International Airport (also a detainment camp) Function: Militaryresearch, construction, detainment camp facilities Levels: 7 reportedTunnels to: Denver proper, Colorado and Rocky Mountain « safehousing »,Colorado Springs, Colorado (Cheyenne Mtn.)6. Falcon Air Force Base, Falcon, Colorado Function: SDI, Satellite ControlLevels: Multiple Tunnels to: Colorado Springs, possibly more. 7. FortCollins, Colorado Function: Suspect high precision equipmentmanufacturing for space. 8. Grand Mesa, Colorado Function unknown 9.Gore Range Near Lake, west of Denver, Co. Function: Library and CentralData Bank 10. San Juan Valley, Colorado Hidden beneath and in anoperating Buffalo Ranch Function unknown 11. Telluride, ColoradoFunction unknown 12. University of Denver, Co (Boulder area) Function:Genetics, geology/mining as related to tunneling and undergroundconstruction. 13. Warden Valley West of Fort Collins, CO FunctionUnknown Tunnels to: MontanaGEORGIA Dobbins Air Force Base, Marrietta GA Function: test site forplasma and antigravity air craft, experimental crafts and weaponsINDIANA Kokomo, Indiana Function Unknown Notes: for years people inthat area have reported a « hum » that has been so constant that some havebeen forced to move and it has made many others sick. It seems to comefrom underground, and « research » has turned up nothing although it wassuggested by someone that massive underground tunneling andexcavating is going on, using naturally occurring caverns, to make anunderground containment and storage facility.KANSAS 1. Hutchinson, Kansas Function unknown Tunnels to: Kinsley,Nebraska 2. Kansas City, Kansas Function unknown Notes: Entrance nearWorlds of Fun 3. 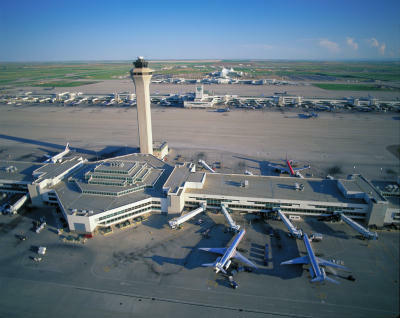 Kinsley, Kansas Function unknown Tunnels to: ColoradoSprings, Colorado; Hutchinson, Kansas; Tulsa Kokoweef Peak, SWCalifornia Notes: Gold stored in huge cavern, blasted shut. Known as the »midway city » because it’s located halfway between New York and SanFrancisco.MARYLAND Edgewood Arsenal, Maryland (from Don) Martins AFB, Aberdeen ,Proving Ground, MarylandMASSACHUSETTS Maynard MA, FEMA regional center. Wackenhut is heretoo.MONTANA Bozeman, Mont. Function: GeneticsNEVADA Area 51 – Groom Lake – Dreamland – Nellis Air Force Base Area 51was said to exist only in our imaginations until Russian satellite photoswere leaked to US sources and it’s amazing how you can get photos allover of it now, even posters. They’ve been busy little bees building thisbase up. Function: Stealth and cloaking Aircraft research & development.’Dreamland (Data Repository Establishment and Maintenance Land) Elmint(Electromagnetic Intelligence), Biological weapons research and geneticmanipulation/warfare storage, Cold Empire, EVA, Program HIS (HybridIntelligence System),BW/CW; IRIS (Infrared Intruder Systems), Security:Above ground cameras, underground pressure sensors, ground and airpatrol 2. Blue Diamond, Nevada Function unknown 3. Fallon Air ForceBase area (the flats, near Reno) « American City » restricted military sitessouthwest of Fallon 4. Mercury, Nevada Function unknown 5. Tonopah,Nevada Function unknown 69: San Gabriel (mountains) On Western side of Mojave Desert Function unknown Notes: Heavy vibrations coming fromunder the forest floor which sounds like geared machinery. Thesevibrations and sounds are the same as heard in Kokomo, Indiana and aresuspected underground building/tunneling operations.NEW MEXICO 1. Albuquerque, New Mexico (AFB) Function unknownLevels: Multiple Tunnels to: Carlsbad, New Mexico Los Alamos, New MexicoPossible connections to Datil, and other points. 2. Carlsbad, New MexicoFunctions: Underground Nuclear Testing Tunnels to: Fort Stockton, Texas.Roswell 3. Cordova, New Mexico Function unknown 4. 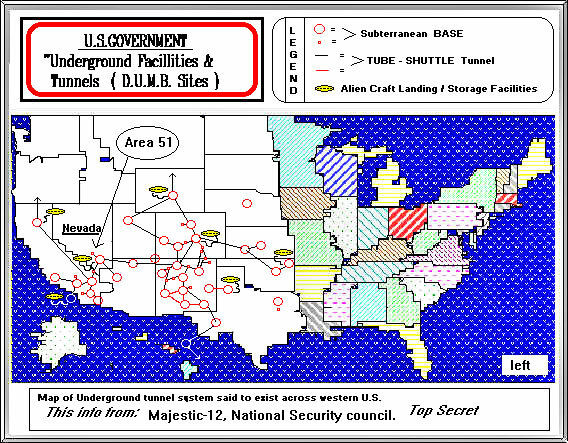 Datil, New MexicoFunction unknown Tunnels to: Dulce Base5: Dulce Base, New Mexico. Tunnels to: Colorado Springs, Colorado Creed,Colorado Datil, N.M. Los Alamos. Page, Arizona Sandia Base Taos, NM6. Los Alamos, New Mexico Functions: Psychotronic Research,Psychotronic Weapons Levels: Multiple Tunnels to: ALB AFB, New MexicoDulce, New Mexico Connections to Datil,Taos 7. Sandia Base, New MexicoFunctions: Research in Electrical/magnetic Phenomena Levels: MultipleTunnels to: Dulce Base Notes: Related Projects are studied at Sandia Baseby ‘The Jason Group’ (of 55 Scientists). They have secretly harnessed the’Dark Side of Technology’ and hidden the beneficial technology from thepublic. 8. Sunspot, NM Function unknown 9. Taos, New Mexico Functionunknown Tunnels to: Dulce, New Mexico; Cog, Colorado Notes: Severalother sidelines to area where Uranium is mined or processed. 10. White Sands, NM Function: Missile testing/design Levels: Seven knownNEW HAMPSHIRE There may be as many as three undergroundinstallations in New Hampshire’s hills, according to reports.NEW YORK New York, New York Function unknown Tunnels to: CapitolBuilding, D.C.OHIO Wright-Patterson Air Force Base – Dayton, Ohio Function: Air ForceRepository. Rumored to house stealth technology and prototype craftOREGON 1. Cave Junction, Oregon Function: Suspected Underground UFOBase Levels: At least one Notes: Suspected location is in or near HopeMountain. Near Applegate Lake, Oregon, just over into California. Multipleshafts, access areas to over 1500 feet depth. 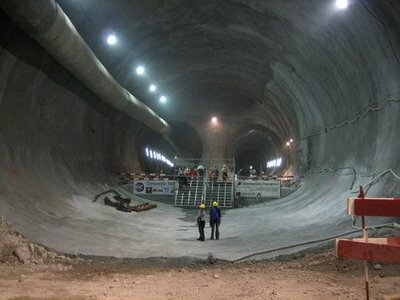 Built using abandoned minewith over 36 known miles of tunnels, shafts. 2. Crater Lake, OregonTunnels: possible to Cave Junction 3. Klamath Falls, Oregon 4. Wimer,Oregon (Ashland Mt. area) Function: Underground Chemical StorageLevels: At least onePENNSYLVANIA Raven Rock, Pa (near Ligonier) Function: working back upunderground Pentagon – sister site of Mt. Weather Notes: 650′ belowsummit, 4 entrances.TEXAS 1. Calvert, Texas Function unknown 2. Fort Hood, Texas (alsoreported detainment camp) Levels: Multiple 3. Fort Stockton, TexasFunction: Unknown Tunnels to: Carlsbad, New Mexico UTAH 1. Dugway,Utah Function: Chemical Storage, Radiation storage. 2. Salt Lake CityMormon Caverns Function: Religions archives storage. Levels: MultipleTunnels to: Delta, Colorado & Riverton, WyomingVIRGINIA Mount Poney – Near Culpepper, Virginia Function unknownWASHINGTON 1. Mt. Rainier, Washington Function unknown. Levels:Multiple Tunnels to: Unknown Yakima Indian Reservation Functionunknown Notes: Southeast of Tacoma Washington, on the Reservation, inan area 40 by 70 miles. Unusual sounds from underground (ToppenishRidge). Low flying Silver Cigar shaped craft seen to disappear into theMiddle fork area of Toppenish creek.Washington DC: The Function: Part of a massive underground relocationsystem to house select government and military personnel in the event of cataclysmic event. Tunnels to: New York City; Mt. Weather.WEST VIRGINIA: Greenbrier Facility, White Sulfer Springs, West Virginiaunder the Greenbriar Resort. Source:special sending from a friend.